On Monday I accidentally packed Wyatt an all red and orange lunch. I just started putting stuff in the box and when I finished it was perfectly color coordinated. Ha! 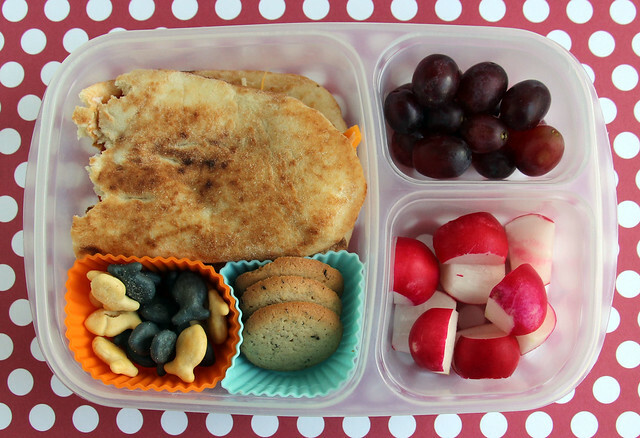 He had pepperoni, carrots, radishes, a pesto and cheddar sandwich, strawberries and two gummy fish. This was packed in the PlanetBox and I used the included inner container to cut the bread into circles so that it would fit perfectly in the largest section of the box. 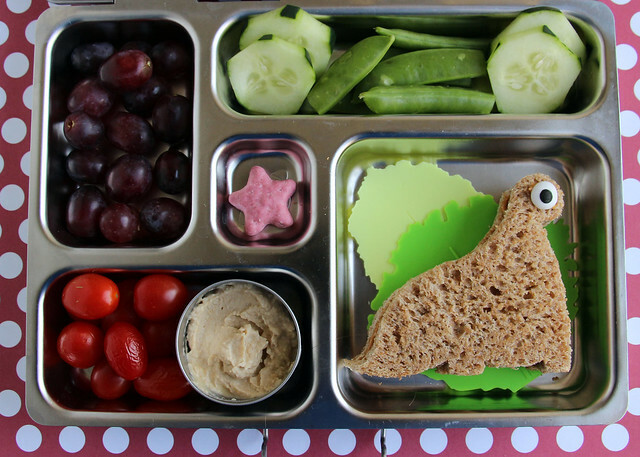 On Tuesday, I packed Augie’s lunch in our Lock & Lock 4-up bento box: grapes, peanut butter sandwiches that I cut into circle shapes and decorated with a fruit leather star, cucumber slices, and grape tomatoes. 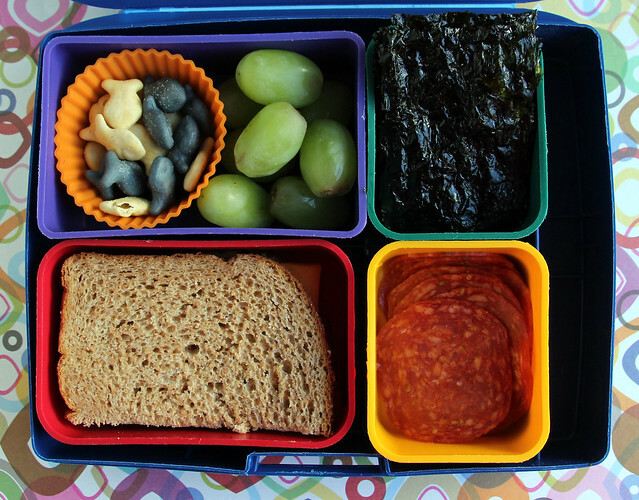 Wyatt’s lunch was packed in one of the Laptop Lunches boxes: blue and white goldfish, grapes, sesame seaweed sheets, pepperoni, and another pesto and cheddar sandwich. The seaweed was from a package of samples I received in the mail the day before and both kids were totally nuts for it. The brand is gimMe and their products will be hitting store shelves in June. They are unique because they are the only seaweed products in the world to be certified organic and non-GMO which I thought was pretty cool. Of course the boys didn’t care about that like I do — they just liked the sesame flavor which neither had ever had before. I pulled the Lock & Lock right back out of the dishwasher on Wednesday morning and used it again for Augie’s lunch. 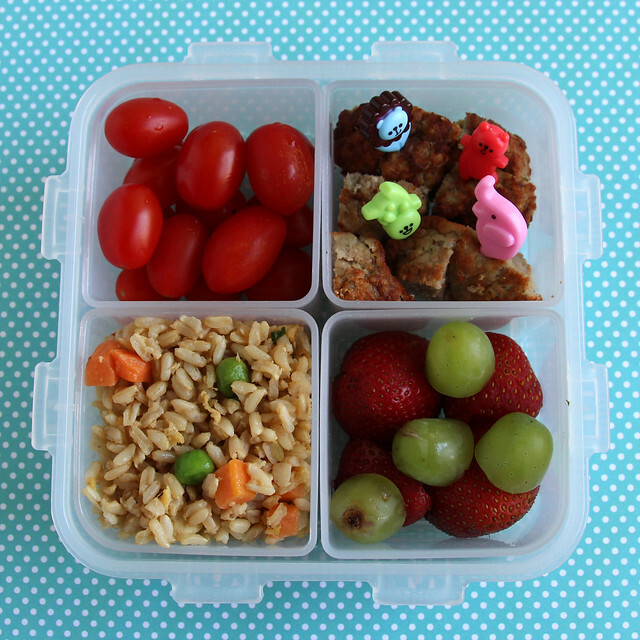 He had grape tomatoes, turkey meatballs decorated with circus picks, strawberries, grapes and fried rice leftover from dinner the night before. This is dinosaur week at Augie’s school and Thursday was the super exciting Dino Day! The teachers buried bones in the yard, along with tiny dinosaur toys that they’d baked into a flour and water mixture to make eggs and the children got to dig them up. They also got to decorate dinosaur cookies at cooking time so it’s fair to say there was just a little bit of dinosaur fever in our house in the morning. I asked Augie if he wanted a dinosaur lunch and he went completely giddy with happiness. I didn’t actually do that much differently than I normally do, but I came up with fun names for everything in the lunch box and he was so thrilled that he threw his arms around my neck and shouted “Thank you, Mommy!” I can assure you that doesn’t happen very often! Wyatt made his own sandwich for lunch. I’d been packing him these pesto and cheese sandwiches all week and he hadn’t been eating them, so I finally made him take a bite of one after school. Of course he loved it (which is why I was making them) and he totally went to town making one after school for a snack on Wednesday, switching up the bread and adding a few more items. The one in this lunch is the same kind: garlic naan, pesto, mayo, cheddar cheese and pepperoni. I had a bite of the one he made for his snack and it was yummy. He also had blue and white goldfish, vanilla wafers, grapes and radishes. This was packed in an EasyLunchboxes box . 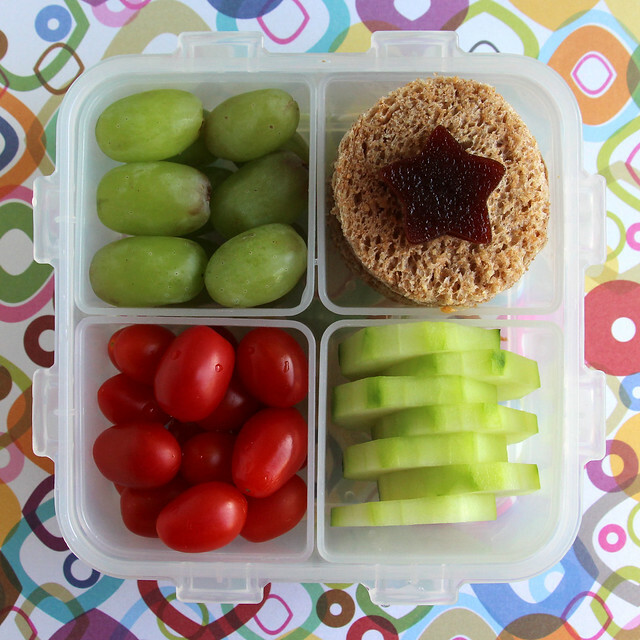 The people at Yumbox sent me one of their lunch boxes to try out this week too. And today I took it out for a spin for the first time. I’ll try to write a little more about this box after I’ve used it a few times, but my initial impressions of it are good. 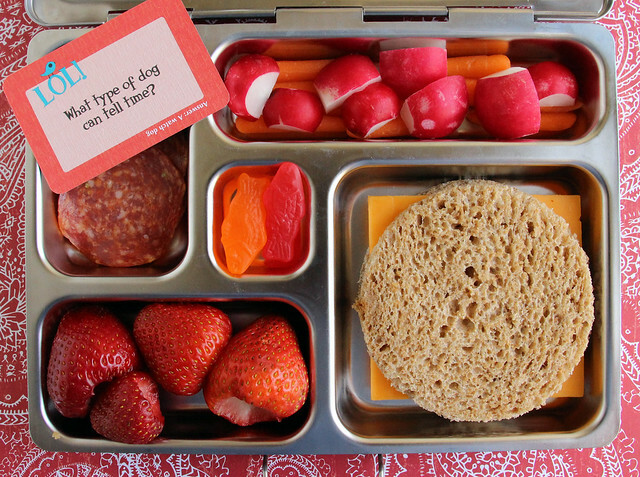 The box is designed to encourage kids to eat from all the different food groups and the different sections are sized according to healthy eating guideline. Augie particularly liked this feature and when he saw the box on the table after school yesterday he insisted that I make him a snack with a serving of each kind of food. Ha ha! Sure Buddy! 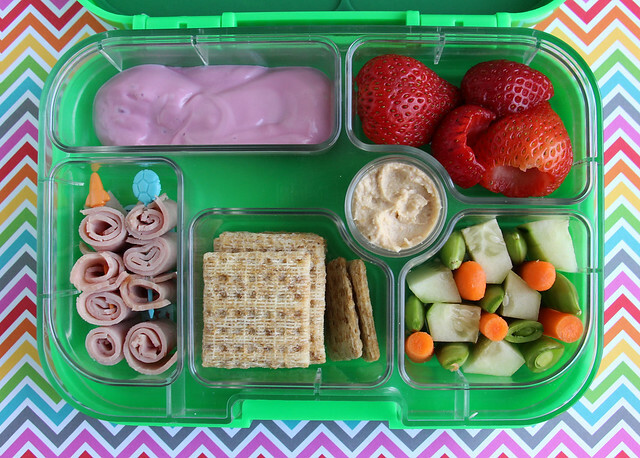 He wanted his lunch packed in it today (Wyatt has dibs on it on Monday) so this is what I put in it: berry yogurt, strawberries, cucumbers, snap peas and carrots, hummus, Triscuits and deli ham roll-ups on rocket and soccer ball picks. 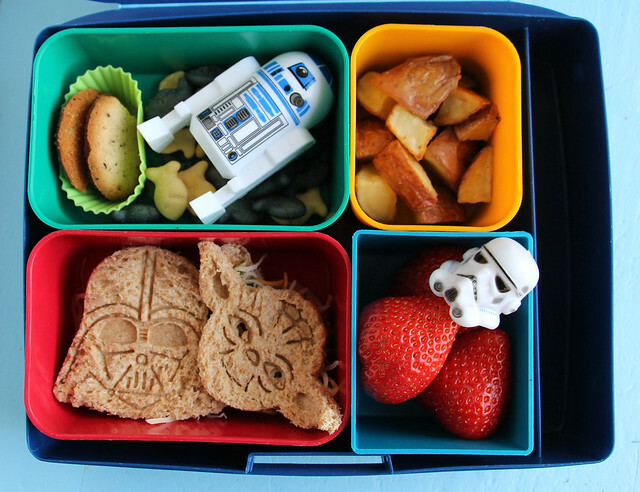 Wyatt had a Star Wars lunch: vanilla wafers, blue and white goldfish in an R2-D2 “Easter egg”, leftover roasted potatoes, strawberries with a Stormtrooper, and Darth Vader and Yoda sandwiches filled with — you guessed it! — pesto and cheese. We were out of sliced cheese this morning and I had to use shredded cheese. That’s why Yoda’s ears look so hairy.